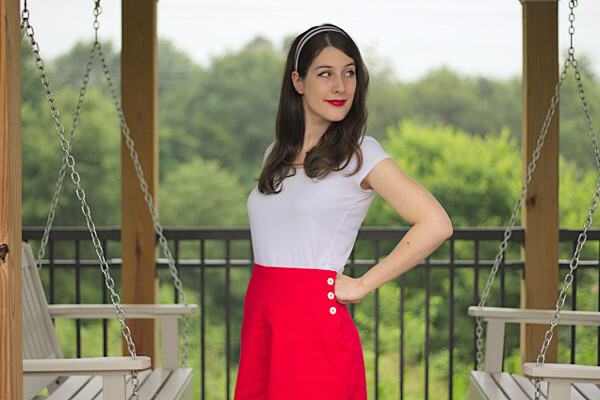 Ever since I moved to the US, I’ve been wearing blue, white and red for the 4th of July. I’ve been told it’s kind of lame, but I don’t care: I am just so excited about the idea of a nation-wide costume party! After a dress in 2013, another dress in 2014 and yet another dress in 2015, I felt it was time of a change, and this year I went with shorts. 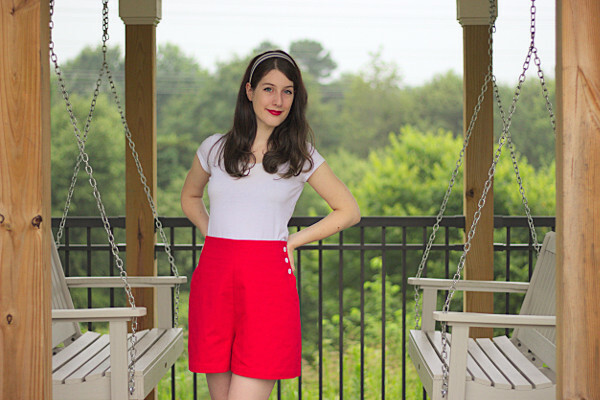 The pattern is the shorts from the Sailor Girl Playsuit from Wearing History. I’ve had it in my stash for a while, but I had never felt like starting it. First off, I’ve seen very few versions of it: just one from Casey Maura and another from Seamstress Erin, both from a few years ago. 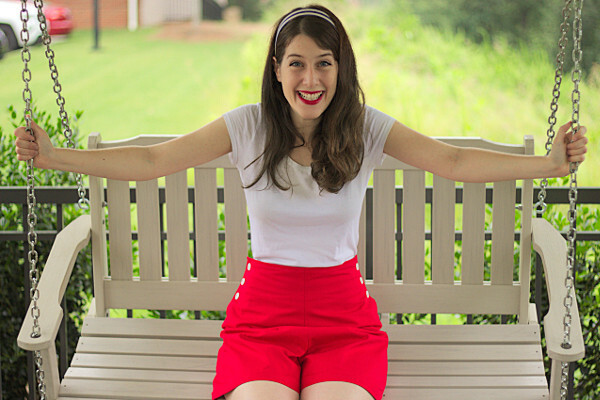 Also, although I liked the idea of these shorts with their high waist and button closures, I didn’t feel ready to go the full-on “sailor costume” route yet. 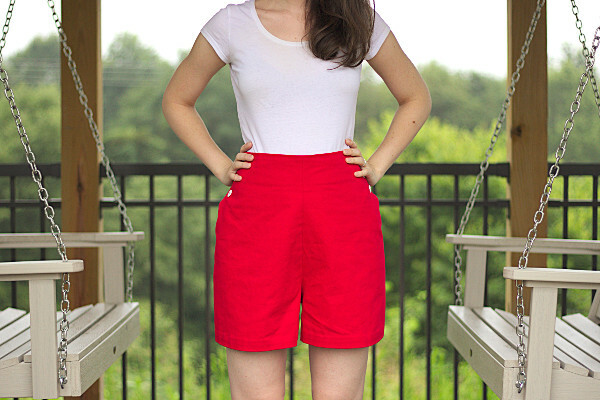 Then this summer I had a last minute need for a pair of red shorts with white buttons. Why is that? Well because I went to Disneyworld with a couple friends and we decided to dress as Disney characters (dressing up without being in a costume, aka “disneybounding”), and the second day I was Mickey Mouse. Yep. So. Moving on. Anyway that’s when I remembered this pattern: retro, high waisted, clean lines, button closures, it was perfect. All I needed was to remove the patch pocket to take the nautical theme down a notch. It was my first time trying Wearing History patterns, and I enjoyed discovering a new pattern brand. Now that I’m working at Deer&Doe I tend to only sew our patterns, and even though I love them it feels good to go out of my comfort zone for once and try out new instructions and construction methods. Especially since Wearing History patterns are a bit unusual: they are based on original vintage patterns, and only the instructions, markings and seam allowances are updated. The pattern itself is true to the original one. This one is from the 40’s, and the fit is very different from modern shorts: the waist is very high and has very little ease, and the crotch is especially low, which makes it a bit skirt-like. The pattern is sold in two size packs, but my bust and waist measurements are in pack A and my hip measurement in pack B. I had bought pack A, so I followed my waist measurement to trace a size 16, and crossed my fingers hoping it would fit my hips. I made a muslin and it was close, but it fitted. I took the opportunity to do a small swayback adjustement (2cm). I’m really happy with the fit in the end! The construction of the shorts is pretty interesting. The main point is the button closures on the sides, which look really cool. And it’s a nice change from invisible zippers! The instructions themselves are pretty sparse. There are a few illustrations, but not with every step. I definitely wouldn’t recommend the pattern to a beginner, but it shouldn’t pose any problem to someone who has made shorts or pants before. That said, I did have some issues with the instructions. The first one is that I feel like there are a few steps missing: if you follow the instructions as written, you end up with some raw edges on the inside. I serged them, and also understitched the facings to avoid them peeking out from the waistline. There is also a small error at step 20-C: “attach back facings to front shorts” should actually be “attach front facings to front shorts”. The step that resulted in a lot of head-scratching was sewing the underlap, which is the rectangle of fabric that is attached to the back of the shorts and underlaps with the front, on which buttons are sewn. First off, it is not on the cutting layout, and is only mentioned in the middle of the instructions for the shorts when the rectangle’s dimensions are given. What if I had tried to optimize my cutting layout, or already had thrown away my fabric scraps after cutting out the pattern pieces? Plus the indications given to calculate the height of the rectangle are not really precise. The width is given, but it resulted in a piece that did not match the width of the front facing, so something might have gone wrong there too. The instructions to attach it to the shorts could be clearer as well. 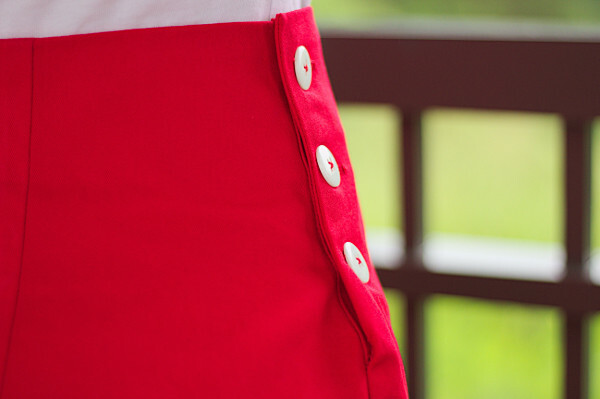 To be honest, I didn’t really understand how I was supposed to sew the buttons on the rectangular underlap and the buttonholes on the curved front, and still be able to close the shorts without the underlap being visible. 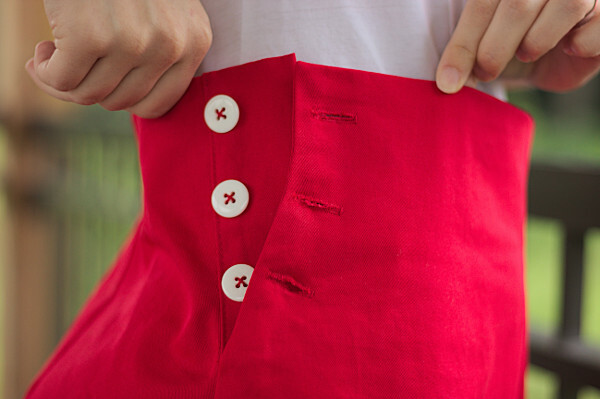 With what I did, I have a pretty result when the shorts are open, but when they are closed there is an ugly fold at the bottom of the button closure. And since I can’t find detail pictures I don’t know if I made a mistake somewhere or if that is how it is supposed to look. Looking at the sample picture I’m leaning towards the second option. I think my stiff fabric was also a problem here, given that the pattern is supposed to be made in lighter and drapier fabrics: cotton shirting, linen, even rayon. 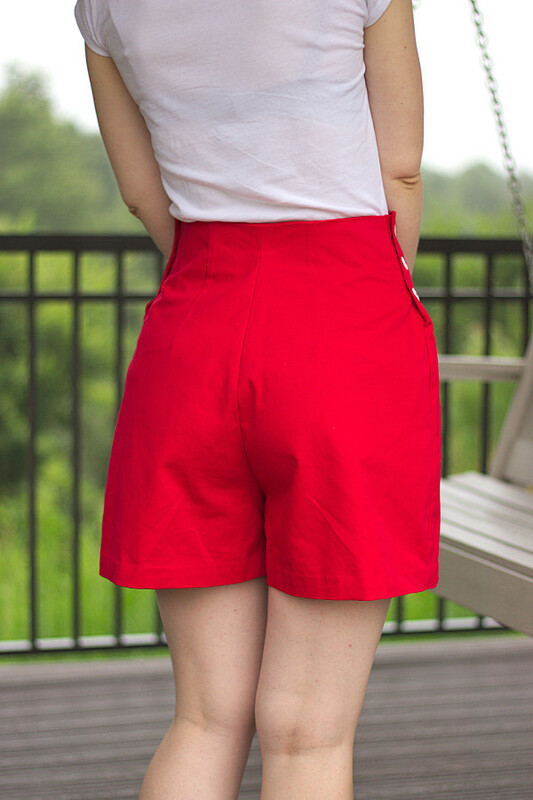 Here I used a very dense gabardine, because it was the only solid red fabric I had in my stash when I needed to make these shorts. I had bought it last year at Jo-Ann for a mini-skirt, and burn-test results tell me it seems to be 100% cotton. This is a very quick project (when making the shorts only! ): it only took me an afternoon. That said I highly recommend taking the time to make a muslin to check the fit, as adjusting the buttons closures after the fact is not really an option. Despite my stiff fabric I am happy with the result. I really like the silhouette and proportions, which are very different from what I’m used to in terms of shorts patterns, and feel very retro. I don’t think I’ll be sewing this pattern again however: because it is such an unusual shape, one should be enough! 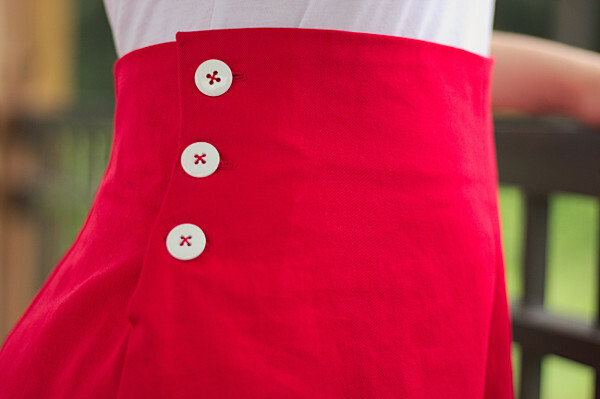 These are too cute – the buttons up the side are adorable! It’s a pity about the instructions problems – issues like that take a super simple project and make it rather time hungry. The end result is well worth it. I must admit if I lived in the States I would go the red/white/blue ensemble as well – how could you not?! How festive! I’d never heard of Disneybounding, but I love the idea of casual cosplay. It seems like a great way to sneak a little extra fun into an outfit for, say, a casual Friday at the office. It’s a bummer that assembling the shorts wasn’t as smooth as it could have been, but the end result still looks really nice. 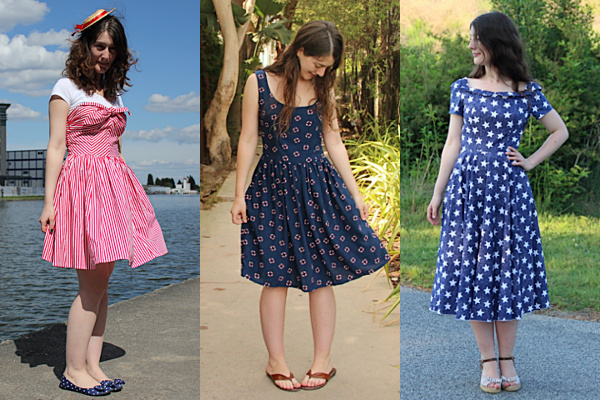 Given the hiccups, are you interested in trying another Wearing History pattern, or do you think you’ll steer clear for now? I’m definitely going to try another Wearing History pattern! I’m not super into the sailor blouse that comes with the shorts (too costumey for my taste), but I own the Sarong separates and I hope I get to make them next summer. They’re so cute! I also have my eyes on the Smooth Sailing trousers but I already have several patterns for wide leg trousers (including the Sorell by Pauline Alice which is lovely) so I might have to let go of this one. I don’t think it’s lame at all to wear American themed things on the 4th! Love these shorts and the fit looks great! As I just said on instagram, super cute! I wouldn’t bother with the Smooth Sailing trousers though – I had so many problems with them due to instructions or lack of and pieces that didn’t match, ugh…. If I lived there I too would do the whole colour thing – it’s such fun to dress up! That’s really good to know, thanks for the info! These are *gorgeous*. I love the sailor style and the fit looks bang on. It’s disappointing to hear the pattern instructions aren’t as clear as they could be though.